I am so scared. Please don't let the others know. You have to promise to take care of me when the others can't. Winter has arrived, and it is harsher than anything Emma had experienced at the isolated compound of women and girls from where she escaped. However, Emma has found a safe place to stay with the Moore brothers. As the temperatures drop outside and the nights grow longer, Emma and the brothers settle in to a comfortable routine in their cozy winter cabin. The brothers teach Emma how to read, the joys of Christmas, and to see her quirks, which made her an outcast at the compound, as something to embrace. When the snow begins to thaw and the start of spring draws near, Emma's nightmares bring her greatest fear to the surface: what if the relationship she and her men have begun to build isn't meant to last? Now that they've found a place in her heart, she's not sure she can live without them. Little does she know, Darcy, Almanzo, Brandon, Harry, and Edward have no intention of letting the young woman who has captured all their hearts slip from their grasp. They intend to prove that Emma can trust and depend on them—always and forever. When a series of unexpected and seemingly impossible discoveries are made, will Emma be able to trust them? And more importantly, will they be able to trust her? 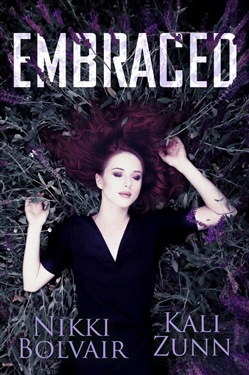 Acquista Embraced in Epub: dopo aver letto l’ebook Embraced di Nikki Bolvair, Kali Zunn ti invitiamo a lasciarci una Recensione qui sotto: sarà utile agli utenti che non abbiano ancora letto questo libro e che vogliano avere delle opinioni altrui. L’opinione su di un libro è molto soggettiva e per questo leggere eventuali recensioni negative non ci dovrà frenare dall’acquisto, anzi dovrà spingerci ad acquistare il libro in fretta per poter dire la nostra ed eventualmente smentire quanto commentato da altri, contribuendo ad arricchire più possibile i commenti e dare sempre più spunti di confronto al pubblico online.